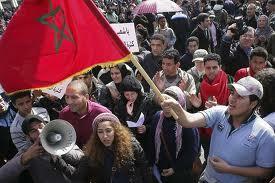 Pro-reform protesters were to take to the streets in several cities in Morocco Sunday in their first demonstration since voters overwhelmingly backed a new constitution curbing the powers of King Mohammed VI. The protests, called by the youth-based February 20 Movement, were to start in the capital Rabat at 6:00 pm (1700 GMT) and in the main economic hub Casablanca at 7:00 pm. The movement had urged its supporters to boycott Friday’s referendum on the new constitution and denounced the result — which saw 98 percent of voters back the reform — as a fraud. “I would have preferred that these people, who say they are democrats, draw conclusions from the sovereign choice made by the Moroccan people,” Communications Minister Khalid Naciri, who acts as a spokesman for the government, told AFP. But the prime minister, chosen from the largest party elected to parliament, will take over as the head of government. Other changes would grant more power to parliament, introduce an independent judiciary and provide new guarantees of civil liberties.